Eleven years ago a group of six five-year-olds mysteriously disappeared without a trace. Now teenagers, five of the missing children find themselves back in their hometown, reunited with the families they left behind but unable to remember anything about what happened to them. After so many years have passed most people never expected the kids to return and of course everyone has a different opinion on what happened to them. Dubbed ‘The Leaving’ based on a comment one of the children made to her mother shortly before disappearing, theories range from them being locked in a basement somewhere to being abducted by aliens. Unfortunately, with their memories gone the truth is a little more complicated to uncover. Taking place over just fifteen days the story follows three main characters, with chapters alternating between their different points of view. We are introduced to Scarlett and Lucas, two of the kids who return from ‘The Leaving’, as well as Avery, the younger sister of Max who is still missing. Although I wasn’t crazy about Avery as a character, I really loved the fact that her point of view was included as part of the story. I found it interesting to hear from someone who remembered the event and to learn more about the huge effect Max’s disappearance had on her childhood. Whilst sometimes multiple points of view can be confusing or sound too similar in this case I felt the three voices were clearly defined. One element that added a distinction was the unique styling choices, particularly in Scarlett’s chapters, with the use of different fonts, unusual spacing and shading which seemed to fit well with the idea of this character’s memory loss. 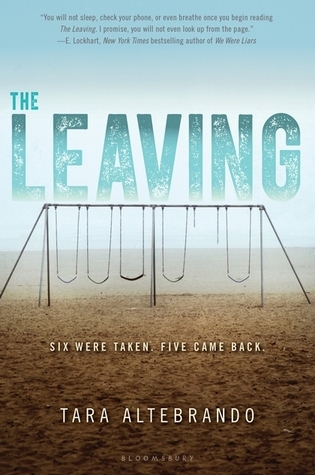 The Leaving is a quick and addictive read with mystery element that will keep you guessing. I really enjoyed following the small clues dotted throughout as the characters remembered snippets of the past and I was keen to find out what had happened to both Max and the rest of the group. Without giving away any spoilers, I can understand why some readers may be disappointed by the way the story plays out in the end, however I don’t think this takes anything away from how enjoyable the overall journey is.